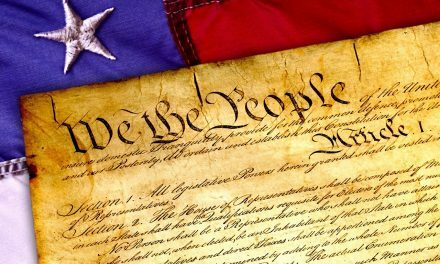 When speaking of the time just before the beginning of tribulation Jesus taught, Nation will rise against nation, and kingdom against kingdom. And there will be famines, pestilences, and earthquakes in various places. All these are the beginning of sorrows, (Matthew 24:7-8). Religion tells us the tribulation is a time when God becomes so sick of man He pours His judgement on us. But the Bible reveals tribulation is the work of the antichrist, not God! Everything in this list of events is the result of what man is doing in the earth. 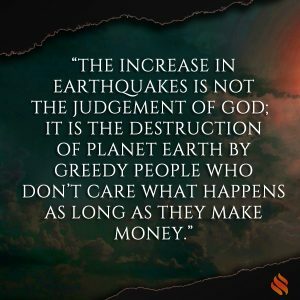 The increase in earthquakes is not the judgement of God; it is the destruction of Planet Earth by greedy people who don’t care what happens as long as they make money. Fracking and building dams is the primary cause of the increase of earthquakes. No doubt the underground testing of bombs has had a catastrophic impact on the earth. Jesus is coming back a second time to save Planet Earth from the destruction of the wicked. Then He will establish His kingdom, where we will rule and reign with Him for 1000 years. During that time we will see how the governments have lied to us about famines, lack of natural resources and the destruction of the earth. We’ll see how religion has lied to us about God destroying earth. We will see how life on earth could have been if we had actually trusted and applied God’s wisdom. During the tribulation we need, more than anything else, to hear and trust God’s voice as He leads us. If we believe He is the problem we will not trust and follow His leading. Jesus told us how we could be overcomers against the greatest darkness the world has ever seen. CLICK HERE to check out my book Apocalypse: A Spiritual Guide to the Second Coming. CLICK HERE for the 8-message CD series. I want you to face the trouble in the world with the confidence that God is good and He will always lead us to victory as we will trust and follow. PreviousThe Bible is so complicated sometimes I’m not sure I get the point. NextIs there any difference between a disciple and a believer?